Sing to the Lord a new canticle, alleluia! For the Lord has done wondrous deeds, alleluia! He has revealed His justice in the sight of the nations, alleluia, alleluia! Ps. 97:1. His right hand has won him victory, and his holy arm has brought salvation. V. Glory be . . .
O God, in whom all the faithful are united in one mind, let Your people everywhere love Your commandments and yearn for Your promises, so that, even amid the changes of this world, their hearts may always be fixed upon the true happiness of heaven. Through Our Lord . . .
Beloved: Every best gift and every perfect gift is from above, coming down from the Father of Lights, with whom there is no change nor shadow of alteration. For of his own will hath he begotten us by the word of truth, that we might be some beginning of his creature. You know, my dearest brethren. And let every man be swift to hear, but slow to speak and slow to anger. For the anger of man worketh not the justice of God. Wherefore, casting away all uncleanness and abundance of naughtiness, with meekness receive the ingrafted word, which is able to save your souls. The right hand of the Lord has exercised power, the right hand of the Lord has lifted me up. Alleluia! Rom. 6:9 Christ, having risen from the dead, dies now no more; death shall no longer have dominion over Him. Alleluia! At that time, Jesus said to His disciples: "I go to him that sent me, and none of you asketh me: 'Whither goest thou?' But because I have spoken these things to you, sorrow hath filled your heart. But I tell you the truth: it is expedient to you that I go. For if I go not, the Paraclete will not come to you: but if I go, I will send him to you. And when he is come, he will convince the world of sin and of justice and of judgment. Of sin: because they believed not in me. And of justice: because I go to the Father: and you shall see me no longer. And of judgment: because the prince of this world is already judged. "I have yet many things to say to you: but you cannot bear them now. But when he, the Spirit of truth, is come, he will teach you all truth. For he shall not speak of himself: but what things soever he shall hear, he shall speak. And the things that are to come, he shall shew you. He shall glorify me: because he shall receive of mine and shall shew it to you." Shout joyfully to God, all the earth; sing a psalm to the glory of His name. Come and hear, all you who fear God, the great things the Lord has done for me, alleluia! 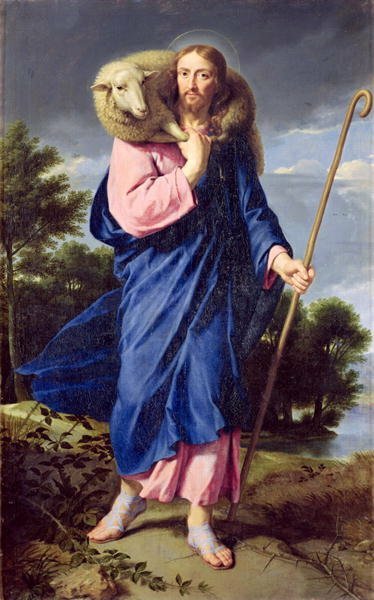 O God, who allows us to share in Your own divine nature by partaking of this sacrifice, grant that our conduct may be guided by Your revealed truth. Through Our Lord . . . When the Paraclete, the Spirit of truth, has come, he will convict the world of sin, and of justice, and of judgment, alleluia, alleluia! Help us, O Lord our God, that we may be cleansed from sin and shielded from all dangers by these Gifts which we receive with faith. Through Our Lord . . . 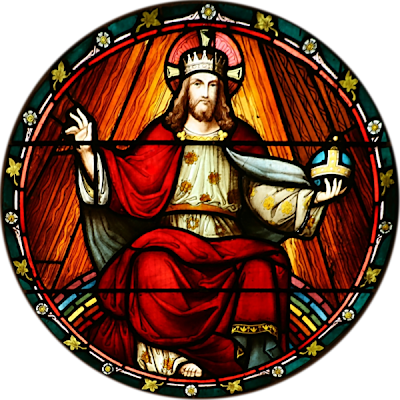 The priests, religious, and lay staff of CatechismClass.com wish you and your families a most blessed Pascaltide as we continue to celebrate our Lord's Resurrection. All of us here wish you continued joy and peace during this season of grace. Please know that your intentions are remembered in our prayers, especially as we pray the Divinum Officium at the altar of God each day. 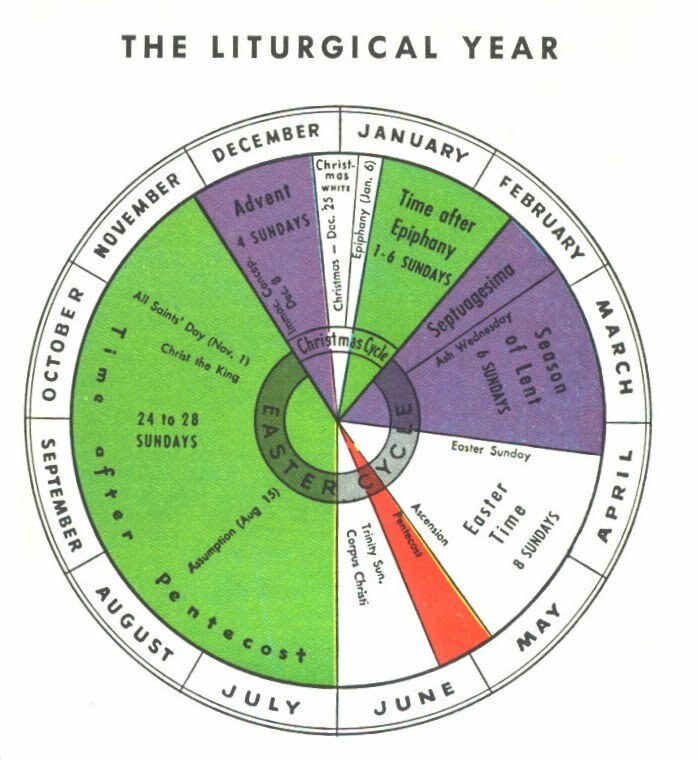 Please consider, as part of you and your children's religious education, adding our Catholic Liturgical Year Program to your schedule. Our Program is meant to provide you with dozens of lessons for Catholic Feasts and Fasts throughout the year. Best of all, if you purchase it now for $59.99, you will lock in at that price and any future lessons added to this program will be uploaded automatically and freely into your account. Not sure if it is right for you? Please check out our lesson on the 4th Sunday after Easter for only $2.99. If you like what you read, please sign up for the Catholic Liturgical Year Course. If it's not for you, then feel no pressure to sign up! May the Virgin Mary bless us with her dear Child. 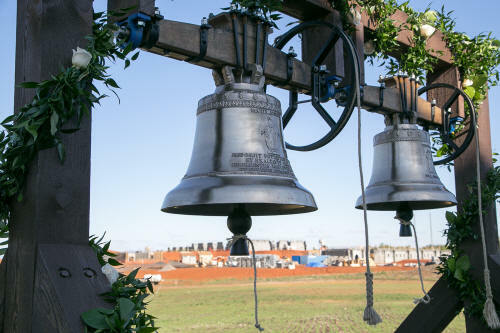 The process for building the new seminary in Virginia for the Society of St. Pius X is well under way. 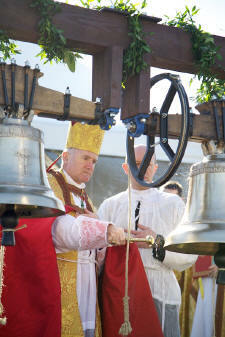 As summarized by the Society's website, "With the Blue Ridge Mountains as the backdrop and a blue sky overhead, Bishop Bernard Fellay presided over the various ceremonies: the blessing of the cornerstone and cloister bells, then a Pontifical Mass, followed by a conference concerning the new project and current affairs in the SSPX." In late 2011, the Society had broken ground for an additional seminary in Virginia. Your support for this project is also much appreciated and needed. Photos are courtesy of the Society's website. 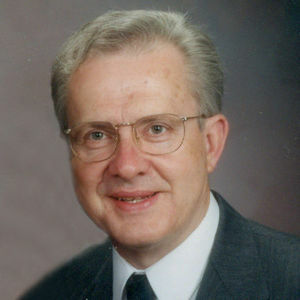 Dennis L. McCoy, age 72 of Long Prairie, formerly of Sauk Centre, died Monday, April 22, 2013 surrounded by his family at the Fairview University Hospital in Minneapolis, Minnesota. A Funeral Mass will be held at 10 a.m. Saturday, April 27 at Our Lady of the Angels Catholic Church in Sauk Centre with Rev. John Paul Erickson officiating. Interment will be in the parish cemetery. Visitation will be from 4 to 8 p.m. Friday at the Patton-Schad Funeral Home in Sauk Centre. A Rosary will be prayed at 5 p.m. and 7 p.m. with parish prayers held at 6 p.m. Friday evening at the funeral home. Dennis Lee McCoy was born September 3, 1940 in Mitchell, South Dakota to Ronald and Marie (Sullivan) McCoy. He graduated from Woonsocket High School in 1958 and went on to Mankato State the following year. In 1959, he started working at the Sioux Falls Argus Leader, the daily newspaper in Sioux Falls, where he met his future bride, Dorothy McDonald. The couple was united in marriage on June 17, 1961 in Sioux Falls, South Dakota. In 1961, they moved to Minnesota and operated the Brooten Review. Along with his brothers, Dennis started the Dairyland Peach in 1967. Together, they ran the Dairyland Peach until the early 1980's. In 1981, he founded the Neumann Press, a classic Catholic book publishing company. He was a former member of Our Lady of the Angels Catholic Church in Sauk Centre. His Faith was very important to him. 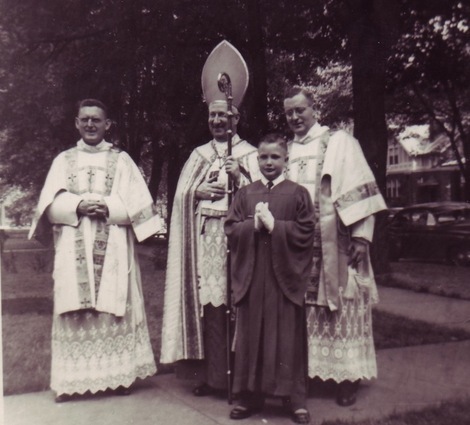 Dennis founded the Central Minnesota Chapter of Una Voce, a group dedicated to the promotion and support of the traditional Latin Mass, in union with Rome. He enjoyed restoring classic cars, woodworking, and listening to his favorite music. He also loved ballroom dancing with his wife at the Lakeside Dance Club in Glenwood and spending time with his family. Survivors include his wife, Dorothy McCoy of Long Prairie; children, Colleen (Joseph) Cianflone of Sauk Centre, Michael McCoy of Long Prairie, Kathleen (Paul) Kerin of Sauk Centre, Timothy (Mary) McCoy of Long Prairie, and Steven McCoy of Long Prairie; ten grandchildren; brothers, Tom (Mary) McCoy of Longmont, Colorado, Jim (Marlene) McCoy of Little Falls, William "Joe" (Audrey) McCoy of Long Prairie; and Brian (Shirley) McCoy of Sauk Centre; brother-in-law, Marvin Vearrier of Sauk Centre; and sister-in-law, Regina McCoy of Browerville. Dennis was preceded in death by his parents; sister, Mary Ellen Vearrier; and brother, Kirk McCoy. Serving as casket bearers will be Dennis's grandsons, Sean Kerin, Brendan Kerin, John Cianflone, and Patrick Kerin. Editor's Note: The videos have been removed from YouTube. Visit the SSPX website mentioned above. Shout joyfully to God, all the earth, alleluia, alleluia! Sing a psalm to the glory of His name, Alleluia, Proclaim His glorious praise, alleluia, alleluia, alleluia! Ps. 65:3. Say to God, "How tremendous are your deeds, O Lord! because of Your great strength Your enemies cringe before You." V. Glory be . . .
Show us the light of Your truth, O God, which guides the sinner back to th epath of justice. Let those who profess to be Christians avoid whatever will endanger their faith, and follow those things which will help it. Through Our Lord . . . Dearly beloved, I beseech you, as strangers and pilgrims, to refrain yourselves from carnal desires which war against the soul, Having your conversation good among the Gentiles: that whereas they speak against you as evildoers, they may, by the good works which they shall behold in you, glorify God in the day of visitation. Be ye subject therefore to every human creature for God's sake: whether it be to the king as excelling, Or to governors as sent by him for the punishment of evildoers and for the praise of the good. For so is the will of God, that by doing well you may put to silence the ignorance of foolish men: As free and not as making liberty a cloak for malice, but as the servants of God. Honour all men. Love the brotherhood. Fear God. Honour the king. Servants, be subject to your masters with all fear, not only to the good and gentle but also to the forward. For this is thankworthy: if, for conscience towards God, a man endure sorrows, suffering wrongfully. The Lord has sent deliverance to His people. Alleluia! V. Luke 24:26. Thus Christ should suffer and should rise again from the dead and should enter into His glory. Alleluia! At that time, Jesus said to His disciples: "A little while, and now you shall not see Me: and again a little while, and you shall see Me: because I go to the Father." Then some of his disciples said one to another: "What is this that he saith to us: A little while, and you shall not see me: and again a little while, and you shall see me, and, Because I go to the Father?" They said therefore: "What is this that he saith, A little while? We know not what he speaketh." And Jesus knew that they had a mind to ask him. And he said to them: "Of this do you inquire among yourselves, because I said: A little while, and you shall not see Me; and again a little while, and you shall see Me? Amen, amen, I say to you, that you shall lament and weep, but the world shall rejoice: and you shall be made sorrowful, but your sorrow shall be turned into joy. A woman, when she is in labour, hath sorrow, because her hour is come; but when she hath brought forth the child, she remembereth no more the anguish, for joy that a man is born into the world. So also you now indeed have sorrow: but I will see you again and your heart shall rejoice. And your joy no man shall take from you." Praise the Lord, O my soul; I will praise the Lord all my life; I will sing praise to my God while I live, alleluia! Note: On this Sunday, April 25th, 2010, the Major Litanies were prayed in a Procession before the Low Mass began. May this sacred rite help us to overcome our earthly desires, O Lord, and teach us to love the things of heaven. Through Our Lord . . .
A little while and you shall see Me no longer, alleluia! and again a little while and you shall see Me, because I go to the Father, alleluia, alleluia! O Lord, may the Sacrament which we have received strengthen us in spirit and comfort us in body. Through Our Lord. According to the previously mentioned book, Jesus also commanded nearly 100 of the holy people in the Limbo of the Fathers to re-enter their bodies temporarily. He then commanded them to visit their relatives and preach the truth - that Jesus Christ was the salvation of the world. With the darkness and earthquakes too, many people were converted and believed after the Crucifixion. All of this took place roughly 1 hour after Jesus died on the Cross. Yet, the patriarchs, prophets, etc in their bodies did not look like Jesus' glorified bodies. They merely re-entered their bodies temporarily to fulfill the command of Jesus. Afterwards, their souls again left their bodies. On that day, the Limbo of the Fathers was forever closed. 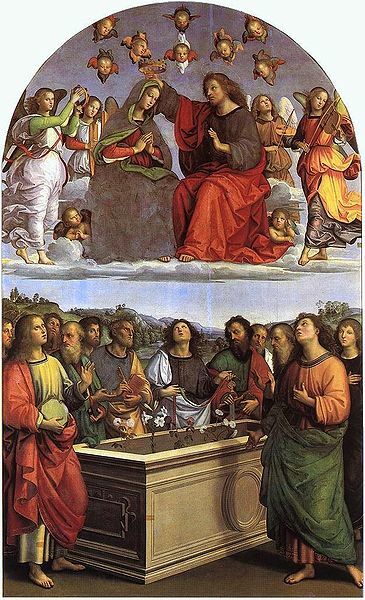 Heaven was opened by the death, Resurrection, and Ascension of Jesus Christ (CCC 1026). Concerning Jesus, Scripture attests, "He is the first fruits of those who have fallen asleep" (1 Cor. 15:12). With His glorified Body, He is no longer bound by the limitations of time, space, or physics. As we believe as part of the Faith also, Mother Mary was assumed body and soul into Heaven. They remain the only two people to have a glorified body. But we too shall follow! That is our hope! The very same Body we have now will be raised again at Judgment. For we, unlike Mary (e.g. Immaculate Conception) and Jesus, are sinners, so our Resurrection is yet to come. At the time of Judgment, all people will be united with their bodies. At that time, the prophets, patriarchs, saints, etc will all receive a glorified body. The Benedictines of Mary: "Angels and Saints at Ephesus"
As you may be aware the Benedictines of Mary, Queen of the Apostles are about to release their second album- Angels and Saints; set for release on May 7! Please listen to some excerpts above as well as some insightful interviews with members of the community. Last Nov./ Dec., the Sisters’ debut album, ADVENT AT EPHESUS, with De Montfort Music/Decca, spent six weeks at #1 on Billboard’s Classical Music Chart, and the Sisters ended up as the #1 Classical Traditional Artist of 2012, according to Nielson’s Soundscan. (That has NEVER happened for a group of cloistered nuns.) 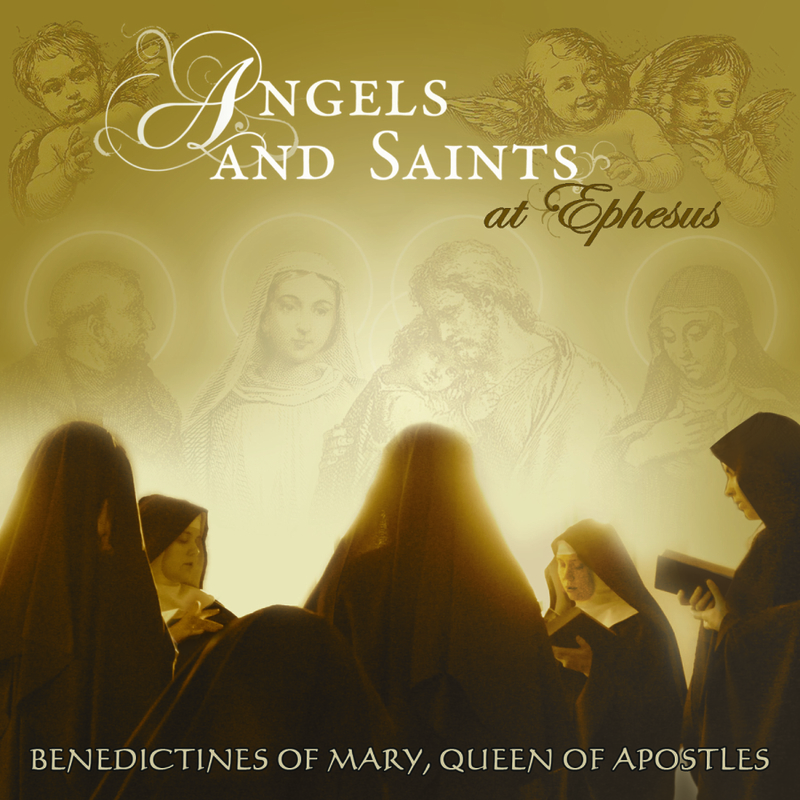 Featured on NPR, USA Today, People Magazine and The Washington Times as well as countless other critically acclaimed press outlets, the Benedictines of Mary have created another beautiful recording of their music. The sisters' second album, a year-round collection, will entertain and inspire, featuring 17 English and Latin pieces sung a cappella for the feasts of the holy saints and angels. Recorded once again at their Priory in the heartland of America, this new album is a dynamic yet pure fusion of their contemplative sound. 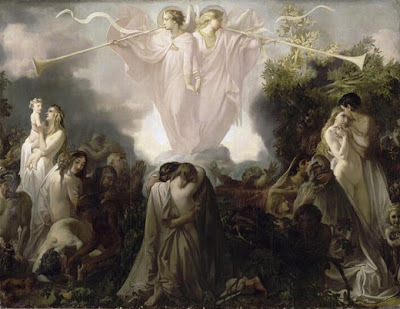 The sisters call to mind the glory of the future vision of God in the company of all of His angels and saints. 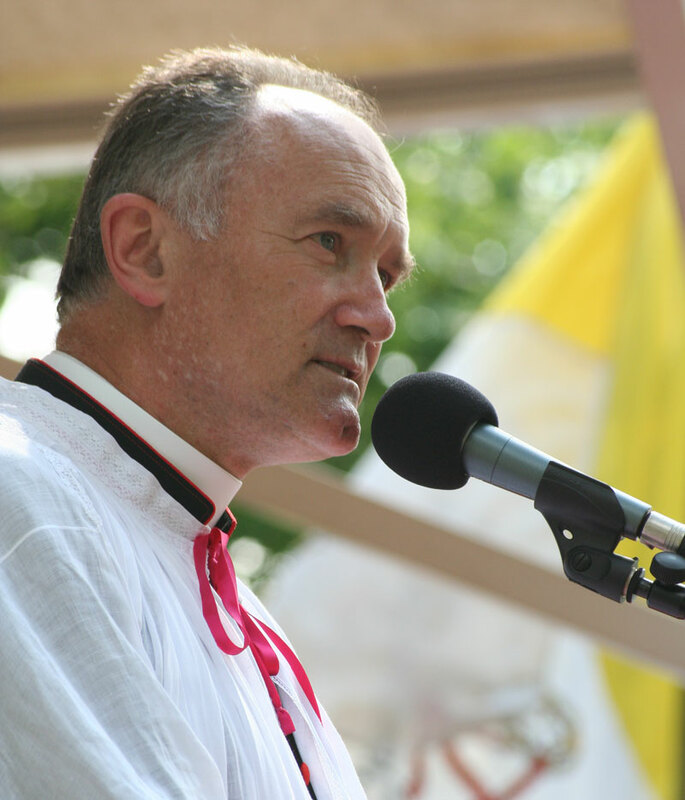 The following is an excerpt from Bishop Fellay's Letter to Friends and Benefactors #80. He specifically focuses on a summary and assessment of the 2012 Doctrinal Talks. The following is an excerpt from his letter. You may read the rest of it at SSPX.ORG. Her hair is cut during the investiture ceremony, symbolizing renunciation of self and world. These are the Adorers of the Royal Heart of Jesus Christ Sovereign Priest, the feminine branch of the Institute. 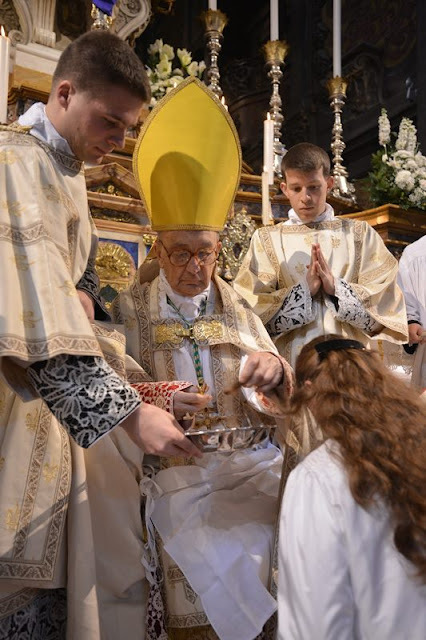 The ceremony took place on the Feast of St. Joseph, 2013, in Florence, presided by His Excellency, Monsignor Giovannetti, Bishop Emeritus of Fiesole. In my childhood the Church arched high above everything. I was awed by its ceremonies. Years later I agreed completely with Pauline Kael when she said that the three greatest American directors of the 1970s — Scorsese, Altman and Coppola — had derived much of their artistic richness from having grown up in the pre-Vatican Two era of Latin, incense, mortal sins, indulgences, dire sufferings in hell, Gregorian chant, and so on. The parish priest was the greatest man in the town. Our priest was Father J.W. McGinn, who was a good and kind man and not given to issuing fiery declarations from the pulpit. Of course, in Catholic grade school, I took the classes for altar boys. We learned by heart all the Latin of the Mass, and I believe I could serve Mass to this day. There was something satisfying about the sound of Latin. Ad Deum qui laitificat juventutem meum. You could go anywhere in the world and the Mass would sound the same, we were told, and the priests could all speak with one another in Latin. The dissolution of that practice at Vatican Two was the end of something that had survived for nearly two millennia. I loved the idea of Latin. I loved the hymns, especially Tantum Ergo, the solemn song at the Consecration of the Eucharist, which had been written by Thomas Aquinas. Crave, as newborn babes, alleluia! pure spiritual milk, alleluia, alleluia, alleluia! Ps. 80:2. Sing joyfully to God, our helper; sing aloud to God of Jacob. V. Glory be . . . 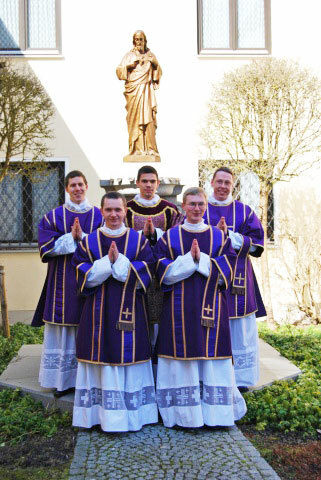 COLLECT - O Almighty God, let our conduct and our lives always be guided by the Easter feast we have just celebrated. Through Our Lord . . .
Beloved: For whatsoever is born of God overcometh the world. And this is the victory which overcameth the world: Our faith. Who is he that overcometh the world, but he that believeth that Jesus is the Son of God? This is he that came by water and blood, Jesus Christ: not by water only but by water and blood. And it is the Spirit which testifieth that Christ is the truth. And there are Three who give testimony in heaven, the Father, the Word, and the Holy Ghost. And these three are one. And there are three that give testimony on earth: the spirit and the water and the blood. And these three are one. If we receive the testimony of men, the testimony of God is greater. For this is the testimony of God, which is greater, because he hath testified of his Son. He that believeth in the Son of God hath the testimony of God in himself. Alleluia, alleluia! V. Matt. 28:7. "On the day of My resurrection," said the Lord, "I will go before you into Galilee." Alleluia! V. John 20:26. After eight days, the doors being closed, Jesus stood in the midst of His disciples, and said, "Peace be to you." Alleluia! SECRET - Graciously receive, we beseech Thee, O Lord, the gifts offered in this season of gladness, by Holy Church to Thee: and even as Thou makest her so greatly to rejoice on earth, so do Thou call all her children to share in the endless delights of Heaven. Through our Lord Jesus Christ, Thy Son, Who liveth and reigneth with Thee in the unity of the Holy Ghost, one God Forever and ever. R.Amen. 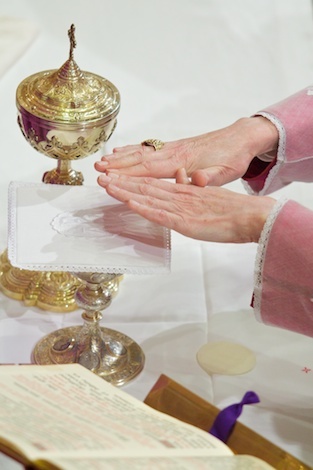 POST COMMUNION - We beseech Thee, O Lord our God, to make profitable to us, both in this world and in that to come, the sacred mysteries by Thee established for the ensuring of our salvation. Through the same Lord Jesus Christ, Thy Son, Who liveth and reigneth with Thee in the unity of the Holy Ghost, one God For ever and ever. R. Amen. 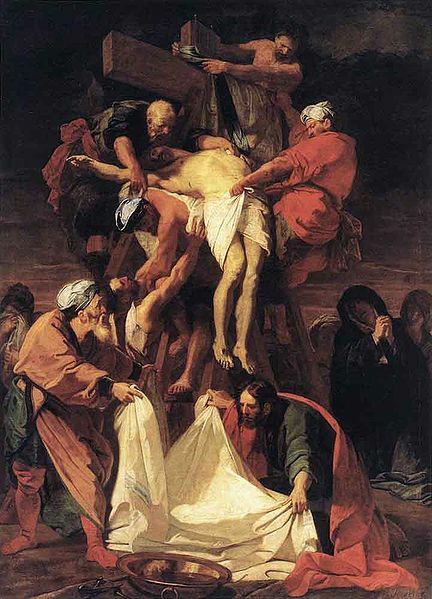 Because those who were baptized on Holy Saturday wore new white garments, Easter Week is also called "White Week" in the Western Church and the "Week of New Garments" in the Oriental [Eastern] Church. During the whole week the neophytes, in their linen dress and soft sandals, stood close to the altar at all services as a separate group within the sanctuary of the basilica. Daily the bishop would address them with special instructions after the crowds had dispersed. It was the honeymoon of their new life as Christians, a week in intense happiness and spiritual joy. It was only after mass of the Sunday Octave of Easter that they exchanged the white garments for the ordinary dress. Easter Monday is still in many countries a day of rest and relaxation. First among them is the "Emmaus walk", inspired by the Gospel of the day (Lk. 24). In Germany and Austria, youngsters would play Easter games and sports (Osterspiele) in the Easter field (Osteranger). In French Canada, the Emmaus walk takes the form of a visit to the grandparents. 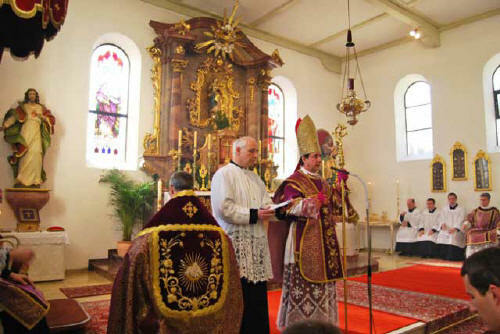 Friday of Easter is a favorite day for devout pilgrimages (Osterwallfahrt). Praying and singing hymns, the faithful walk for hours preceded by a cross and church banners. In the Austrian Tyrol, people walk ten hours each way. In some sections of German and Austria, the farmers make their pilgrimage on horseback, accompanied by a band playing Easter hymns. The Sunday after Easter received diverse names. It was called the "Octave of the Pasch" from the earliest centuries. It acquired later the name of "Sunday in White" (see above), hence the "White Sunday." 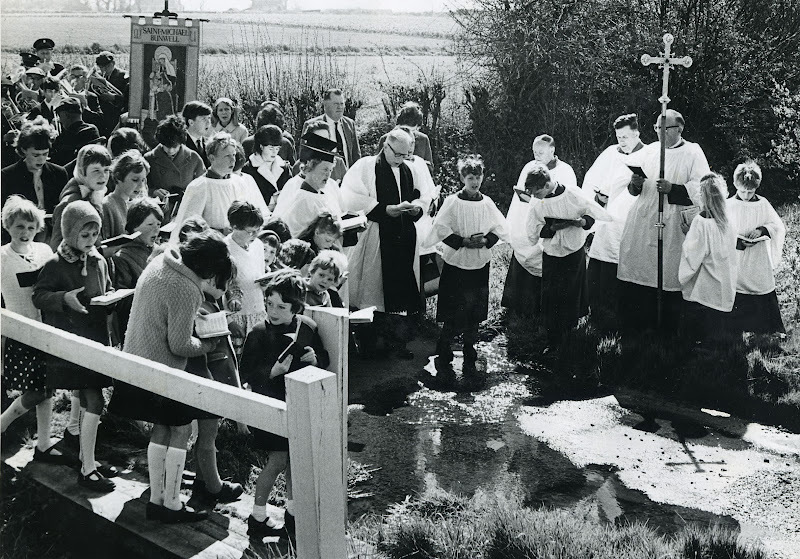 The English term "Low Sunday" comes from the ancient practice of counting the octave day as belonging to the feast, so that Easter actually would last eight days including two Sundays. The primary (high) one is Easter Sunday, and the secondary (low) one the Sunday after Easter. Low Sunday was in medieval times the day for the first communions of children. Dressed in white, they enter the church in solemn procession, holding lighted candles. In some places, each child receives first communion with father and mother kneeling beside him, also receiving the Blessed Sacrament. 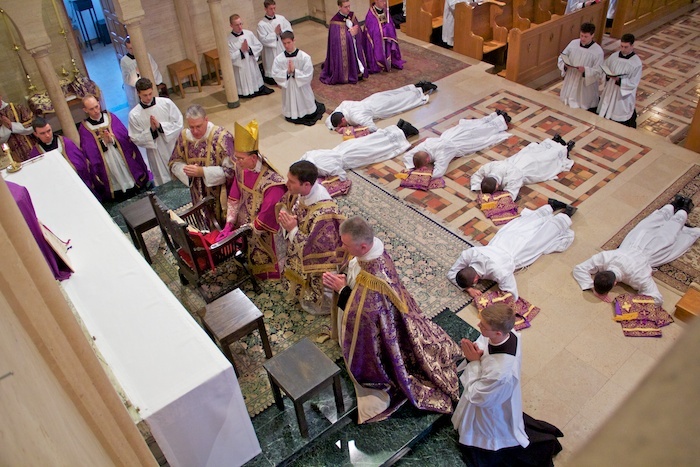 On Friday, March 15, 8 young men were raised to the minor holy orders of Porter, Lector, Exorcist and Acolyte, preparatory steps for the sacred priesthood. On the following day, Sitentes Saturday, 6 acolytes were elevated to the rank of subdeacon (the first of the major holy orders), thus continuing the progressive cycle in seminary life which will climax in the priesthood of Our Lord Jesus Christ. The website of the SSPX.ORG has some stunning photos of these ordinations. Below are just a few of them. The following is taken from the website of the Society of St. Pius X. These sentiments proudly and correctly teach us the great importance and connection between Calvary and the Resurrection. Also, please do not forget that the Society of St. Pius X needs the generosity of traditional Catholics to continue its saving ministry. Please consider making a tax deductible donation to them here. 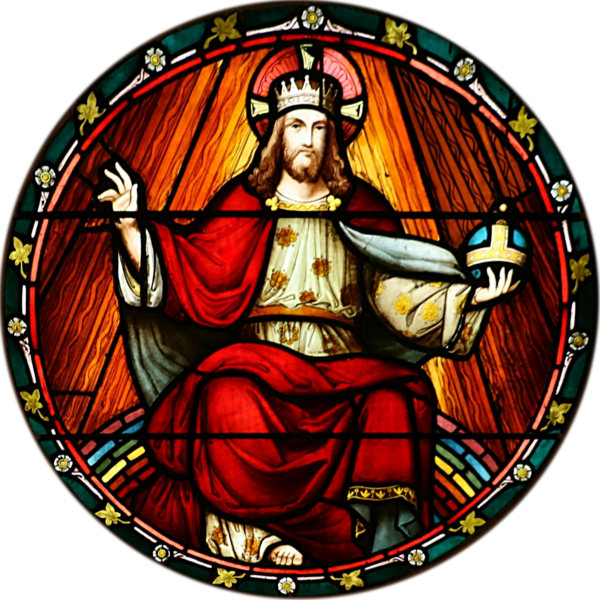 Throughout the Christian world, Easter resounds with the shouts of "Alleluia!" Praise be given to God for all he has done to mankind! To save the slave, He has delivered His Son. The Father has so loved the world that he handed over His Son for us all. This is the wonder of the Good Friday drama that the depth of God’s love has been revealed to men. We cannot speak of Easter Sunday without reference to Good Friday. 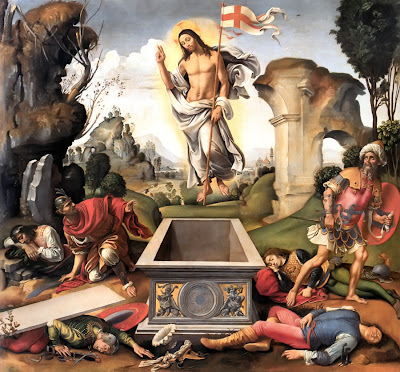 The Resurrection cannot come unless One has previously died. "Per Crucem ad Lucem - by the Cross to the Light!" The victory of Christ over death ("O Death, I shall be your death") is the fruit of the total sacrifice of Christ on Calvary. Truly, no greater love has man shown than to give one’s life for those he loves. Yet, Our Lord did more. He showed the greatest love by dying for those who hated Him! What did Christ do during the three days (according to the Jewish count) in the sepulcher? The Scriptures speak to us in different ways of the abode Christ’s soul went to after death. To the ‘good’ thief, He said: "In this very day, you will be with me in Paradise." 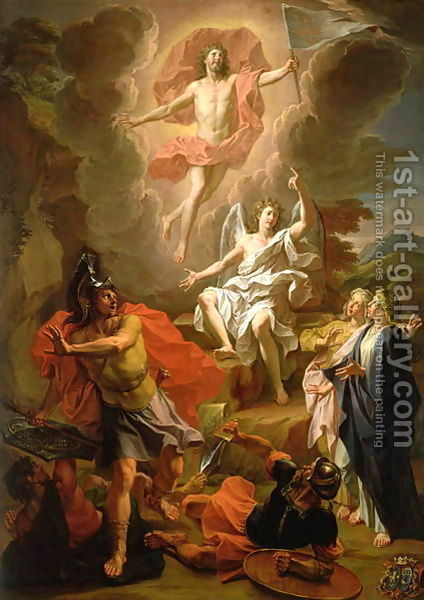 And yet, on Easter Sunday, the risen Christ tells Mary Magdalen that He has not yet ascended to the Father, for heaven is closed until Ascension Thursday. The Apostles’ Creed tells us that "He descended into Hell", although this does not mean the Hell of the damned. The Latin takes away the ambiguity speaking of it in the plural ‘inferos’ vs. the singular ‘infernum’. What does this refer to? It is the literal sense of ‘inferum/infernum’, that is, the lower region(s). Christ’s soul did not visit Satan’s realm, but the lower regions where the just souls were detained. St. Peter refers to the same place by the name of prison: "He went and preached to the spirits who lay in prison." This is because the just in limbo, called also elsewhere the bosom of Abraham, were held captive until the Redeemer had fulfilled His mission of ransoming them from all debts to God. And so, on Easter Sunday, the cries of victory resound loud and clear. The Eastern Christians greet each other with these words which proclaim their rock solid faith: "Christ is risen - He is risen indeed." Victory for the Church triumphant celebrating the anniversary of their glorious King, crowned only after the bloody battle; victory for the Church militant for "This is the victory which has conquered the world, our faith"; victory for the Church suffering because His rising with the glorious body is the pledge of their own resurrection and glory one day after their purgation.